Watcharin describes the elements in his universe, including the colours, creations and creations. 'Angel’ which also can be viewed as a dragon if turned upside down. Having tapped into the vast content, colours, tones, and visions within this special place, Watcharin has found the inspiration to express and share what he has seen and felt through his collection entitled“My Universe”. 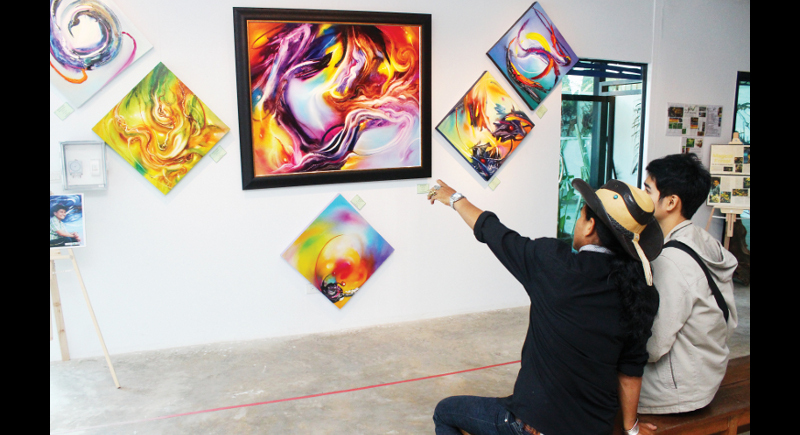 Before opening “Watcharin Art Studio” in Boat Plaza in Sam Kong, Watcharin, who has a Masters of Fine Art from Thailand’s premier art school – Silpakorn University – had exhibited the works of “My Universe” in several places on the island including the Nitjasilp Gallery and at Mom Tri’s Villa Royale Phuket, as well as in Malaysia. Asked what medium and technique he used, Watcharin smiles and says proudly yet reserved, “I take time on each piece of my art using ‘my own techniques’. 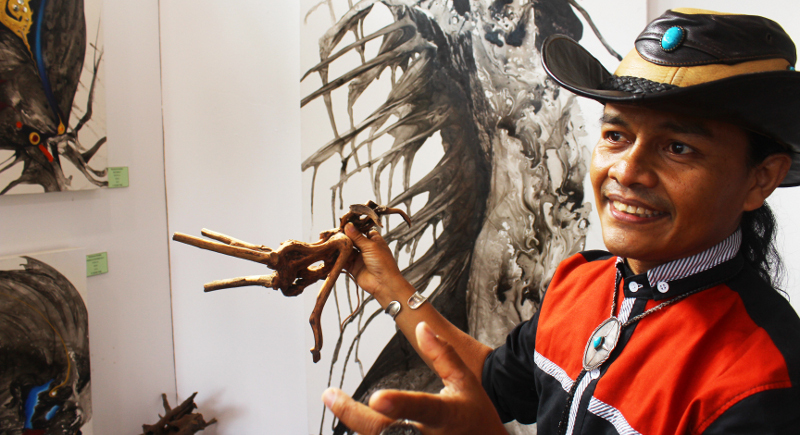 Asked about the source of his inspiration and ideas, the artist reveals, “In my imagination, I’ve become acquainted with a talking tree who has made a special connection to my heart and mind,” he said. From the stars of the remnents of forests of trees shining brightly. He added, “Then, I just started to paint, and the visions began to appear on the paper. Indeed, Watcharin’s imagination is multi-faceted, and such a vast universe of content can be found in his painted depictions, in which objects take on many forms. “In my paintings, there are hidden creatures inside,” he says as he unveils some of his works to me and my friend. 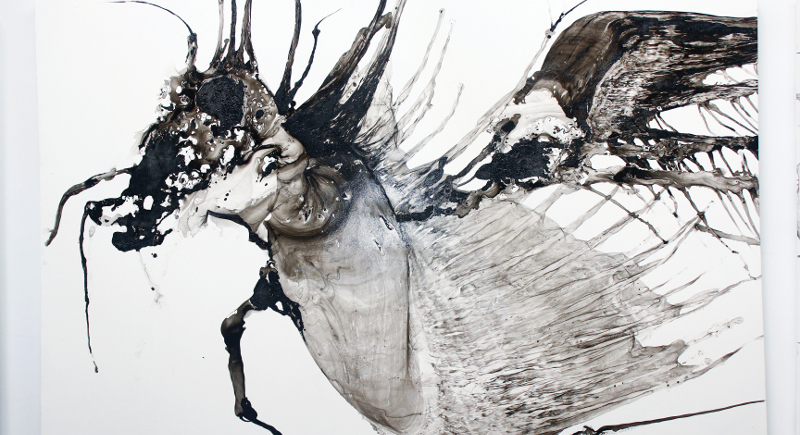 Looking at his paintings, we see these creatures, but our interpretation of them is not always one in the same. “Different people see different things in my paintings because their thoughts and imagination are all unique,” Watcharin explains. I am surprised about the many creatures my friend is able to identify – I think he is more imaginative than me. Watcharin points to a creature in one of his paintings. I cannot figure out what it is. “This is called ‘Angel’,” he says. The subject is painted in gray and black tones on a white background. I do clearly. But then he turns the painting upside down, to show it from a different perspective. It instantly becomes a dragon. “Do you see it?” he asks. I do. He added that he also likes to depict the forces within his “universe” – namely that of the wind and other momentous elements. He turns our attention to another painting. From my perspective, the “red eyes” are in fact dark blue but with light red points in them. It is a bit of a scary painting. As these creatures stare at us, they are breathing and living inside the art. An eerie feeling overcomes me, and the hairs on the back of my neck rise. It seems like these creatures are just waiting for you to look back at them.